Being a mobile marketer is no cakewalk! Let’s face it. Given the ever-increasing competition across app stores, rising above the clutter to drive app adoption and stickiness is an eternal challenge. Identifying the right channels to engage with your users in a personalised, relevant, and timely manner assumes incredible significance. Set in this backdrop, the two most significant weapons at your disposal are push notifications and in-app messages. In-app messages are nothing but messages that you can craft and delivery to your users when they are active within your mobile app. Not only does this add another dimension to your entire mobile marketing strategy, but it also enables you to engage with your users in real-time, capitalising on every mobile moment. In fact, it helps you complement your entire multi-channel marketing machinery, in conjunction with other important channels of communication such as email, browser push notifications, web messages, and SMS. Are In-App Messages really THAT effective? Let me rephrase that: Indeed. Without a doubt! What are the advantages of In-App Messages? 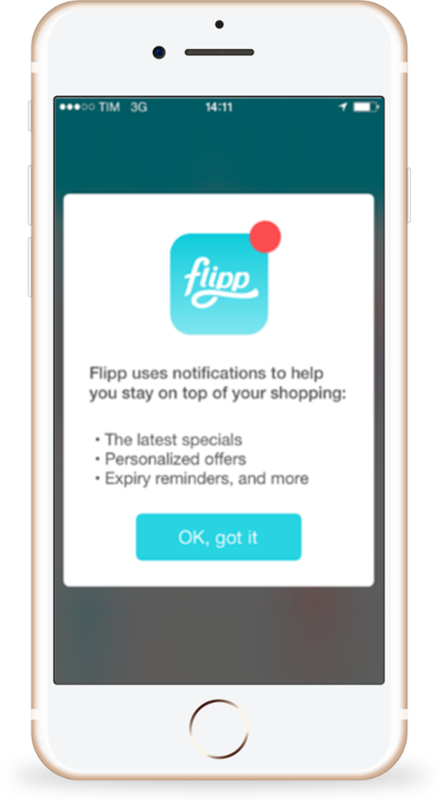 Unlike push notifications that have an average opt-in rate of 30–35%, in-app messages don’t require your users’ buy in! You can reach your entire user base (broadcast campaigns) or specific sections (user segment-driven campaigns) depending upon your campaign objectives. 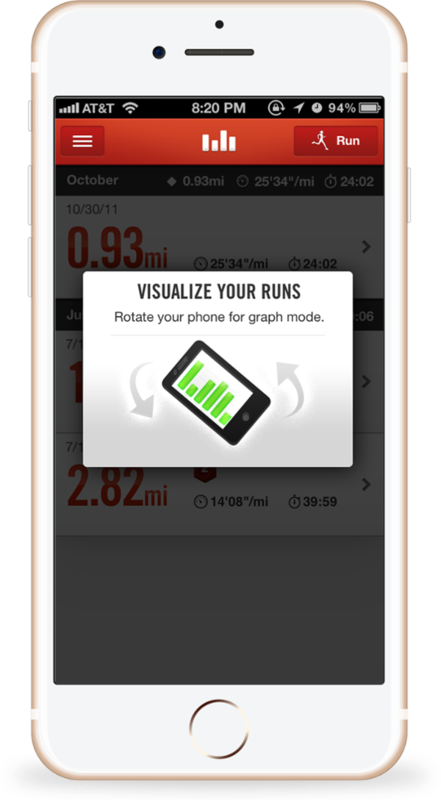 By leveraging your users’ demographic, geographic, device-related data points, you create a unified view of your users. These insights when coupled with their in-app behaviour, actions, and inactions can be used to craft extremely personalised and contextual in-app message campaigns, ensuring that you deliver the right message to the right user, at the right time. 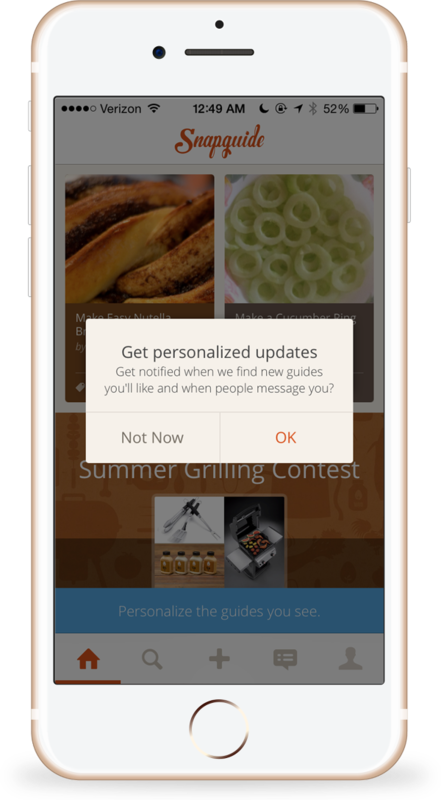 In-app messages give you a chance to embed your engagement communication within the confines of the app universe. Such campaigns become an internal extension of your product, service, or content, nudging users towards conversion events of your choice. Think of in-app messages as directional markers and milestones, gently helping your new users navigate towards actual conversion. A seamless UX coupled with helpful messages triggered at the right time can help you move users from first time app launch to conversion sooner. 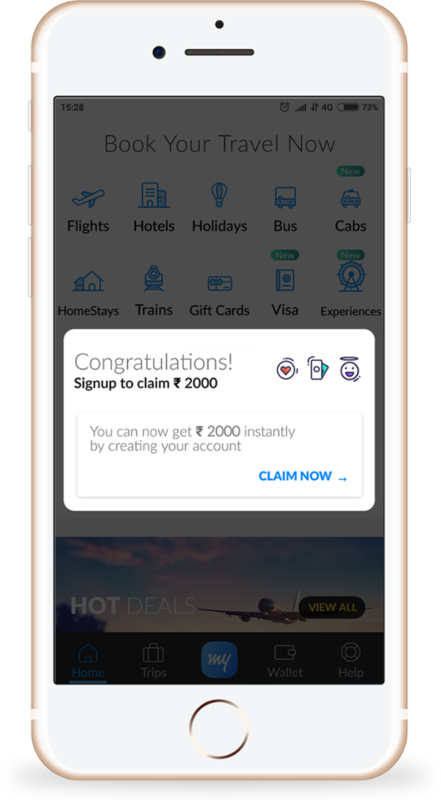 Such conversion activities can vary across apps, ranging from a video watched on a media OTT platform, to a ticket booked on a travel app. Think of in-app messages as tools of redirection, especially when coupled with relevant and compelling CTAs containing appropriate links that send users to the desired destination within your app or mobile site. This gives you the flexibility to use personalisation as a tool to drive definitive user action. What kind of In-App Messages are most effective? You’ve worked incredibly hard to drive app awareness and have managed to secure user acquisition through app downloads. 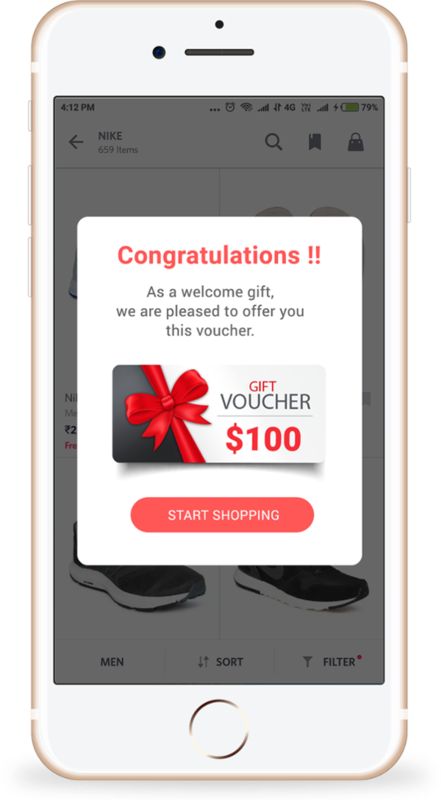 Why not express your gratitude by greeting new users with a welcome in-app message, on first time app launch? This is your opportunity to create the foundations of a lasting customer relationship by creating your users’ first in-app Aha! Moment during the onboarding process. You can send customised messages with simple information on how users can navigate across your app, calling attention to key app features that will help them get started ASAP. Such campaigns, that aim to establish an instant emotional connect with first-time users, have proven to reduce app uninstalls by almost 20–25% within the first 30 days alone! Additionally, you can send messages encouraging first-time users to opt-in to receive push notifications, login, complete registration, or update their profiles. Mind you, users are more likely to enable push notifications if you clearly outline the relevant value they would receive by enabling the same. This shouldn’t come across as a hard-sell. Remember that your users are already sent large volumes of brand communication that is often intrusive and overwhelming! So, tread carefully! While welcoming new users is important, it is even more important to empower this user segment enough to nudge them towards a first conversion event. 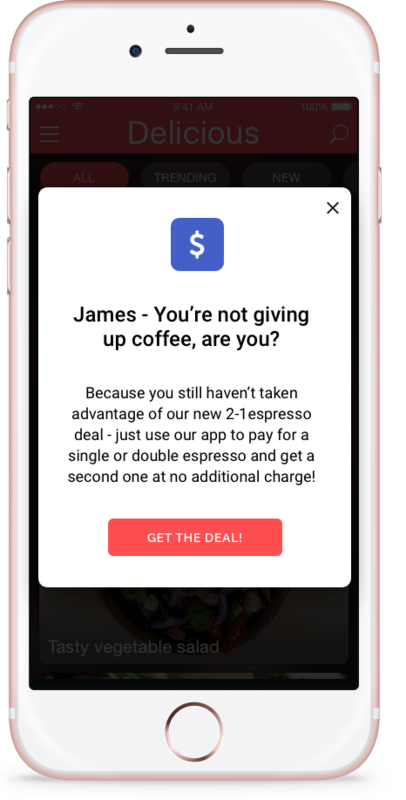 Triggering in-app messages offering a promo offer, referral code, first-time purchase discount, etc. goes a long way in incentivising purchase. This is especially true in the case of e-commerce, travel, ride hailing, food delivery, and payment wallet apps. Your objective in such a scenario is to quickly convert a new user into a transacting customer that is delighted with a satisfactory first-time user experience (FTUE). You can add another layer to your first-time conversion campaigns by also automating the delivery of an email to all those users that don’t respond to the in-app message. The idea is to maximise the chances of conversion through a multi-channel marketing automation approach without creating brand dissonance. These are the campaigns where the proof of your user engagement pudding lies, determining the difference between monetisation and app usage drop-offs. Such campaigns can be used to pitch relevant offers, discounts, time-sensitive flash sales, new cross-sell/upsell deals, etc. either to your entire user base or targeted at specific user segments based on their previous browsing behaviour, purchase history, geo-location, and time zone. Traditionally broadcast campaigns might produce mixed results. You are in a better position to improve user engagement and resultant conversions by laser-focusing your campaigns at relevant user segments. These campaigns are most relevant to e-commerce, online grocery, travel, food delivery, ticketing, telecom, and media OTT players. The objective must always be to contextualise the in-app message so as to personalise the entire end-to-end app usage experience. And, the better you understand your users’ behaviours, personas, and preferences, the better can you tailor-make such campaigns. The versatile nature of in-app notifications gives you the opportunity to draw attention to new or under-utilised app features, new services introduced, products added to catalogue, content added to library, etc. The agenda is to educate, inform, and empower your users with enough relevant information to better leverage your app platform, open up monetisation opportunities, increase content consumption, and average session lengths. The messaging would, in turn, differ from promotional nudge campaigns. Such campaigns can be crafted and run for multiple industries such as e-commerce, banking, travel, productivity, media OTT, music, gaming, fitness apps, etc. Picture a scenario where if you happen to be a media OTT app that offers a live sports streaming section as part of your content library, you want to encourage a specific user segment that watches only cricket highlights to consume more content. You could trigger an in-app message encouraging this user segment to subscribe to your annual live sports viewing plan for a nominal sum to enjoy the action in real-time! If you happen to be a travel app, using an in-app message, you can suggest a cheaper flight at a more convenient time to a user who often books tickets off your platform to a particular destination. All these recommendations are made on the basis of your users’ historical and real-time in-app behaviour and activity. That’s the surest way to contextualise your campaign communication. Such campaigns work best for e-commerce, media OTT, news, travel, food delivery, payment wallet apps, etc. Relevant recommendations play a massive role in simplifying your users’ decision-making process by giving them options to exercise that are meaningful. Your mobile marketing and app engagement strategy is incomplete without in-app messaging added to the mix. By leveraging in-app messages and push notifications, you can build a double-pronged engagement strategy — both within and outside the app — that helps you boost user engagement and retention sizably. 5 Best Examples of In-App Messages to Power User Engagement was originally published in Marketing And Growth Hacking on Medium, where people are continuing the conversation by highlighting and responding to this story.